Scratching is a 100 percent normal feline behavior. Although scratching is a totally healthy and standard behavior in cats, that doesn't make the consequences any more pleasant to deal with. Think unsightly and conspicuous scratch marks all over your living room wall ... ugh. Kitties scratch for a variety of reasons, all of which are normal. Although your innocent and unassuming kitty may not appear to be so, she's actually a territorial little being. All cats are, actually. Your cat scratching the wall may be her way of claiming her turf in your home, something akin to an outburst of "This is for me! Only me! Me!" Feline paws have scent glands; when your pet scratches a wall, she's emitting her individual odor onto the surface. Apart from just the odor, scratching also leaves an actual mark, a reminder that you and other cats can see. A household cat may scratch a wall as a means of giving her claws a little bit of physical fitness via flexing. It also may give the forelimbs a little much-needed workout. Scratching a wall may help a kitty stretch out her physique -- totally understandable for a cat that spends her entire day indoors. Your cat may scratch the wall as a way of keeping her claws healthy and functional. Scratching a hard surface such as a wall wears down the points of the outside husk. When bits of cracked outside husk of each claw wear away, new, improved and sharper nails are growing in beneath. If you have a multiple-cat home, one may turn to scratching the wall as a technique for leaving "scent" messages and communicating with other felines in the household. Scratching a wall may be beneficial for your cat's gait. Perhaps your kitty is attempting to get up from the floor quickly and just needs to scratch the wall to achieve a little bit of very necessary balance. Nothing too mysterious or complicated about that scenario. 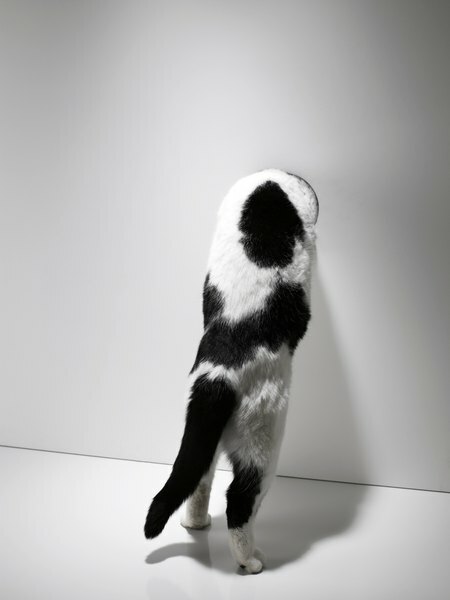 If your poor kitty is feeling anxious or stressed out about something, scratching a wall may help her soothe herself and gain some comfort back. Cats find a lot of relaxation and reassurance in their own individual scents, after all. If your cat's wall scratching is a problem, scratching posts may be exactly what you need. Invest in a variety of scratching posts for different rooms within your home -- the more the merrier. Opt for different sizes, textures and shapes, whether vertical, horizontal or curved. The more choices your cat has, the less likely she will be to wreak havoc on your walls. Encourage your little one to utilize the posts by sprinkling some alluring catnip on them. Otherwise, consider deterring your pet from scratching your wall by making it harder to access. If it suits your decor, perhaps a wall mural or tapestry in front of one of her favorite scratching sites will suit. Regular nail-trimming may minimize scratching and its destruction. Let a groomer do this, and ask him to show you the proper technique. Meanwhile, if you suspect territorial anxiety as cause for your pet's scratching, perhaps recruit the talents of a qualified pet behavioral expert in your area. Escondido Humane Society: Why Do Cats Scratch? Cat Care Society: Why Do Cats Scratch?